Hugh McCurdy Woodward served as the first President of Dixie College in St. George, Utah, beginning in 1914 and continuing through 1918. Emily Woodward, his wife, was hired as Domestic Science and Domestic Arts teacher at the St. George Stake Academy in 1911. Hugh Woodward was born in December, 1881, in Huntington, Utah to Enoch J. Woodward and Ann L. Raymond Woodward. He attended Uintah Stake Academy in 1900-01, then Brigham Young Academy High School in 1902-03. He and his wife, the former Emily Timothy, married on October 18, 1905 in Salt Lake City, and became the parents of three children, one son and two daughters. Hugh Woodward attended the Beaver Branch of BYA in 1905-06, then Brigham Young Senior High School in Provo again in 1906-08, graduating with the BYH Class of 1908. He received his Bachelors degree from BYU in 1911 and was promptly hired as the first principal of the St. George Stake Academy. After the announcement of his appointment, many older folks in the St. George area shook their heads in doubt, worrying if anyone so young and inexperienced could handle the rugged over-aged and over-sized characters that were likely to enroll in the new school. When Professor William J. Snow of BYU was home for a vacation in Pine Valley, he was asked about Woodward. He is said to have replied, "If he can't handle it, I don't know who can." According to the school's first announcement, the curriculum was designed to provide for four years of high school work. Courses were planned in 15 different subject areas. Even though school was a few days late in opening, the enrollment far exceeded expectations. The first week's totals showed 121 students had registered, but later in the year over 135 students were enrolled. The St. George Stake Board of Education set the registration fee at $15 per year for that first year, but later reduced it to $10 payable in two equal payments. Students often gave produce and hauled wood for the school or labored in some other way to provide the money for tuition. A lifetime registration fee was offered the next year, 1912-1913. A student could register for $16 for his/her lifetime plus $10 for each year they attended. They could then study at the school for as many years as they desired. The school had its own bookstore so that book prices could be kept at a margin just above cost. The Church and school leaders were very conscious of keeping the expenses for students to a bare minimum. That first fall, Principal Woodward, with suggestions from the faculty and the students, organized a school government. Laws were written to govern the Academy. The student self-government worked out well, giving the students greater freedom than at other schools in the State, and at the same time instilling a greater spirit of cooperation because they were obeying their own rules. The new student government was run according to the City Commission form, with a Chief Commissioner, five other Commissioners, a Chief Justice and Prosecuting Attorney. The officers were responsible for writing the laws and regulations to run the school. Their proposed laws were then submitted to the student body for ratification. A 10-member police force was chosen to help carry out the school laws. Woodward taught the enforcers the phrase: "A soft answer turneth away wrath." This form of student self-government became a model for several colleges and high schools in Utah and other Western States, after they sent for pamphlets outlining the system. Some of the school laws reflected the LDS religious background. For example, the use of tobacco and liquor was prohibited. Students convicted of boisterous, ungentlemanly or unwomanly conduct risked expulsion. Visiting the local pool hall was prohibited, and it was unlawful to use profane language. Students having a grade point average of 75% or lower were not allowed “out” on weekends. Principal Woodward was always concerned with establishing good policies which would help the growth and future stability of the new academy. The first school constitution was ratified January 29, 1917. The academy established a preparatory school in 1912 for students, usually older, in the below high school grades so they could move up to the more advanced classes. The long tradition of “D” Day has its roots in the 1912-13 school year. It began when the Class of 1913 went to the red Sugar Loaf bluff in the Red Hills north of St. George and painted the numerals "1913" in large white letters on the face of this prominent landmark. This move created considerable attention both among the students of Dixie and many of the townspeople; but most concerned were the students of the Class of 1914. This class was three times larger than the Class of 1913 and this younger class, known as the "Dolphins" -- so-named out of respect for their president, Dolph Atkin -- decided that "1914" would look much better on the face of the Sugar Loaf than "1913". As a result, it was only a few days until the original numeral "3" had been obliterated with red paint and a brand new figure "4" appeared in its place. After this, it was not unusual to see a change in the numerals every few days. In fact, it became customary for everyone in town to look toward the Sugar Loaf each morning to see who had been on the job during the night shift. After the Class of 1913 graduated, the members of the Class of 1915 developed a taste for ambitious projects, and took up the challenge where the Class of 1913 had left off. The encounters were no longer confined to the Sugar Loaf on the Red Hill. Quite a class rivalry was started. It was not long before things began to get out of hand, and President Woodward and the student body officers met together in emergency sessions to discuss what kind of a program would bring all the students together, and do away with counter-productive class rivalries. 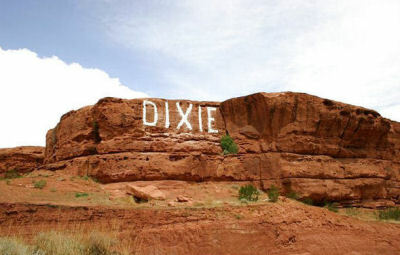 It took some time to achieve the desired results, but out of this effort came two ideas: first, to build a school letter on one of the surrounding hills, similar to that of the "Y" in Provo, and second, to write the word "Dixie" on the Sugar Loaf in place of any class numerals. While the original name of the school was "St. George Stake Academy", it was so frequently referred to as "Dixie Academy" that in 1918 the name was changed officially to Dixie Normal College. In 1914, Hugh M. Woodward was named the first President of the Dixie Normal College, and because of this he became known as the "Father of Dixie College". During the leadership of President Woodward, the original Dixie College Administration Building and Gymnasium were constructed on Main Street in downtown St. George. Soon after school began in the fall of 1914, a committee of interested students, faculty, and many townspeople, met together and decided that the proper place to build the school monogram "D” was on the face of the Black Hill west of town. Friday, February 19, 1915, was an historic day for the school. It was on that day that the actual building of the "D" took place. That date became the school's own holiday, and was to become the first regularly established holiday for Dixie College. "D" Day activities included a downtown parade in the afternoon, a lunch and after-lunch program on the hill, mid-afternoon sports on the campus, the lighting of the "D" about 9 p.m., followed by the closing event of the day, the D-Day Dance. This dance has become one of the most popular events during the school year. At the dance the D-Day Queen and her attendants receive appropriate honors, participate in the floorshow, and everyone at "D" Day activities renews their loyalty to Dixie College and the Dixie Spirit. During the hot St. George summers, President Woodward had been working on his graduate studies, earning an M.A. from the University of Utah in 1918. In 1918, the Woodward family left St. George and went to the University of Utah. In 1920 he went to the University of California where he earned his Ph.D. degree. He worked for the Bureau of Public Health in Washington D.C. in 1920-21, then returned to Brigham Young University in various capacities, including Dean of Summer Session and Professor of Philosophy, until 1936. He spent four summers as a Professor of Education at the University of Washington. St. George, Utah is the county seat of Washington County. It is the largest of the towns founded during the LDS Church's Cotton Mission of 1861. Located in the southwest corner of Utah at 2,880 feet above sea level -- relatively low for Utah (Provo's elevation is 4,549 feet above sea level) -- St. George has mild winter temperatures and hot, dry summer temperatures into the 100s. It gets little rain -- 8.3 inches annually, and when it rains it often comes in torrents. However, the normal growing season is 196 days, and this factor made the area a fairly suitable location for early settlement. By 1854, the LDS Church had established an Indian mission at Santa Clara, two miles north of the St. George valley. In 1857 and 1858, experimental farms were set up to the east and west of where St. George was to be built. While touring the experimental desert farms in May 1861, Brigham Young predicted the settling of the area. Five months later, in October 1861, 309 families were called by church authorities to settle the "Cotton Mission". When the Civil War broke out in 1861, Brigham Young thought it would be necessary to raise cotton, if possible. Many of the early settlers of St. George originally came from southern states. They brought with them a phrase for the area which has become widely adopted -- they called the area "Utah's Dixie." St. George itself was named in honor of George A. Smith, who had personally selected most of the company of the pioneers of 1861, although he did not live in St. George. The first years in the new outpost were difficult. Great rainstorms almost destroyed the farmlands, and intense summer heat and lack of culinary water made life far from pleasant. 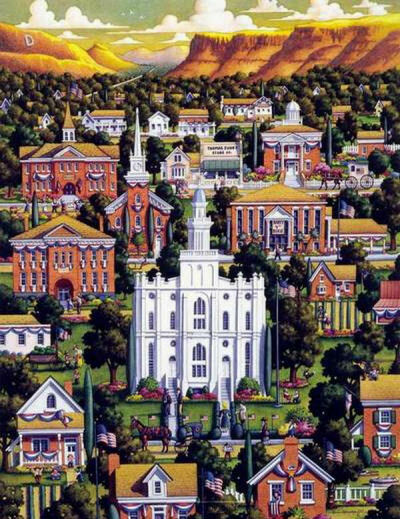 In 1863 construction of the St. George LDS Tabernacle began. It was completed in 1875. In November of 1871 work began on the St. George LDS Temple. Construction of the temple was a cooperative effort of many communities in southern Utah. The area was suffering from a monetary depression, and a work project was welcome in which employment would mean food for families. The building cost $800,000 and was dedicated on April 6, 1877 -- the first LDS temple to be completed in Utah. Other important area buildings from the pioneer era include the historic courthouse (1870), and the social hall and opera house (1875). Silk was produced in the area as early as 1874 but did not add to the material prosperity of the city. Nevertheless, the mulberry trees which were planted to feed the worms, have continued to provide shade to the city's residents, although the sidewalks beneath them are dyed blue from falling fruit. Other early pioneer endeavors included producing molasses from sugar cane, dried fruit, and vineyards to produce wine. Edward H. Snow [BYA HS Class of 1883] is considered to be the principal educational, religious and governmental leader of Utah's Dixie. As an educator, Edward taught school, became the superintendent of county schools, then chaired the county school board later on. Snow founded what is now Dixie State University. Other leaders recognized as founders include Thomas P. Cottam, George F. Whitehead, James G. Bleak, David H. Cannon, Arthur F. Miles, David H. Morris, and John T. Woodbury. The fiftieth anniversary of the settlement of St. George was marked by construction of the Dixie Stake Academy Building in 1911. 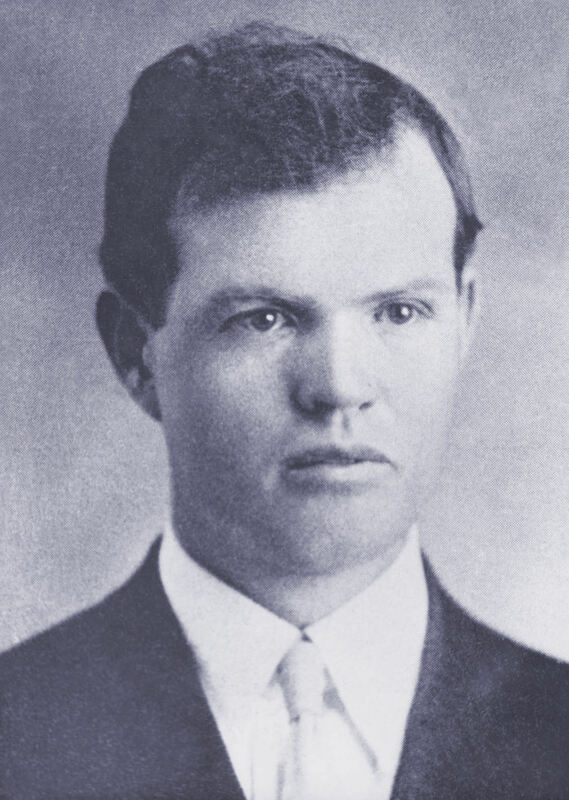 The founding educational leader of the school was Hugh McCurdy Woodward [BYH Class of 1908], who served until 1918. Erastus S. Romney replaced Woodward as College President in May of 1918. He had come to the school as a member of the faculty in June of 1916. Following the appointment of President Romney, the Academy was accepted by the Utah State Board of Education as an official Normal College, authorized to give two years of work leading to the Normal Diploma. The St. George Stake Board of Education on May 27, 1918, officially changed the name of the school from the St. George Stake Academy to the Dixie Normal College. During President Romney's administration the school offered 60 hours of College level work. He firmly believed that character building was one of the primary duties of the College, along with maintaining high standards of scholarship and efficiency. He was well known for his ability to arouse enthusiasm in a group of students. He was president for only one year and one semester. In February 1920, as the worldwide influenza epidemic became more and more serious, President Romney became ill of that disease and soon died. He was only 34 years of age. Following the death of President Romney, Joseph Kelly Nicholes [BYH Class of 1908] was made president and served in that capacity until the end of May 1923. The Academy was operated by the LDS Church until 1933, at which time it became a two-year college within the state higher education system. In the 1960s, a new Dixie College campus was opened in the southeast corner of the city. In 2005, enrollment at the college was approximately 8,400 students. It was now a four-year institution named "Dixie State College". In 2013 the Utah Legislature changed the status of the institution from a college to a university and named it Dixie State University. The leaders of Dixie State University and others recognized this as the fulfillment of the dream of the original Mormon pioneers of the area to have a university serving the young people of their communities. Academic staff currently stands at 435, and student enrollment is approximately 9,000. In 1950 the population of St. George stood at 4,562. The city experienced slow growth until the 1990s, when it jumped to 28,500. By 2012, St. George's population reached 75,561. A large part of the local economy comes from tourism, since St. George is in proximity to Zion National Park, Bryce Canyon National Park, Grand Canyon National Park as well as several state parks and recreational areas.